Do you call them lightning bugs or fireflies? Here in the South, they’re lightning bugs. You don’t remember a lot about when you were a kid, but I remember being 4 or 5 and staying out late to catch lightning bugs. Dad said he used to catch lightning bugs when he was a kid and put them in a jar, and that’s how he had enough light to read at night. I’m pretty sure he was kidding. Anyway, I saw my first lightning bug of the year last night. It was the perfect start to the long Memorial Day weekend and a sign that, no matter what the calendar says, it’s summertime. Fireflies, though that’s mostly in memory of the greatest TV show ever made – Firefly. I know they live in the south, but I don’t think I’ve seen one since I moved here! We didn’t see any when we lived in Florida. I missed them. I uses them interchangeably, but I think I use Lightening bug the most. That’s probably because my mo is from Kentucky, so that’s what she called them. 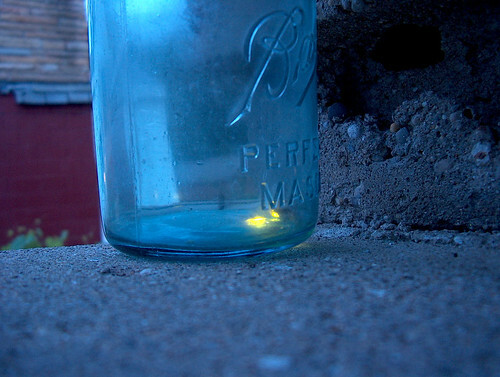 Lightning bugs… and I love seeing the 1st one of the summer. It makes me smile and feel like a kid again. Btw, I really love the picture at the top of your blog. My granny and pa had a set of green chairs and glider like those. I miss them so much and kick myself for not keeping them after they passed. My granny did, too. Yellow ones. Lightning bugs! I live in Knoxville, TN. Growing up here my sisters & I spent many Summers catching them in pickle (or jam) jars, poking holes in the lids, hoping to keep them as long as possible… they never lived long, sadly. Now my husband & I love to watch them dance in the grass & the trees in our backyard on these warm, humid Summer nights & reminisce about being kids in the South.